Creating a world-class science project is no easy task, but this year thousands of 13-18 year olds from more than 120 countries submitted their project to the third annual Google Science Fair. After further judging and deliberation, today we’re announcing the 15 finalists from our top 90 regional finalists, as well as the winner of the Scientific American Science in Action Award. From the creation of an exoskeletal glove to support the human hand to managing the impact of infrastructure projects on endangered species to an early-warning system for emergency vehicles, the caliber, ingenuity and diversity of this year’s projects is a testament to the fact that young minds really can produce world-changing ideas. The 15 finalists will join us at our Mountain View headquarters on September 23 to present their projects to an international panel of esteemed scientists for the final round of judging. The Grand Prize winner will receive a 10-day trip to the Galapagos Islands with National Geographic Expeditions, $50,000 in scholarship funding and more. We’re also announcing the winner of the Scientific American Science in Action Award, which honors a project that makes a practical difference by addressing an environmental, health or resources challenge. An independent panel has selected Elif Bilgin from Turkey for this award for her work using banana peels to produce bioplastics. Congratulations to Elif, who will receive $50,000 and and a year’s worth of mentoring from Scientific American to help develop her project. Elif’s project is also one of the 15 finalists, and she is still in the running for the Grand Prize Award. 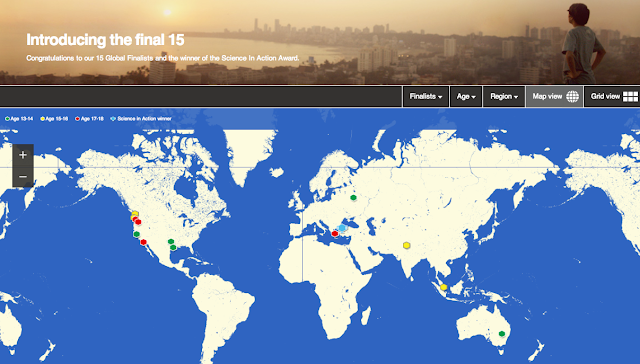 Which of the 15 finalist projects do you think has the potential to change the world? While the official judges will decide the 2013 Grand Prize Winner, in August you’ll be able to participate in this year’s competition by voting for the Voter's Choice Award. Visit the Google Science Fair website August 1-30 to vote for the project you think has the greatest potential to change the world. Check back for more details, and tune in live to see the finalist gala on September 23, which will be broadcast on our website, Google+ page and YouTube channel. Congratulations to all our finalists. We look forward to meeting in Mountain View! Update July 30: Updated the name of the Voter's Choice Award (previously the Inspired Idea Award). This entry was posted on Thursday, June 27, 2013 at 10:00 AM. You can follow any responses to this entry through the RSS 2.0. You can leave a response.